The Mother of God has been given many names by the Church to describe her special role and presence in the Church throughout its history and these names speak to us of certain particular attributes which she expressed so vividly in her life and in her close and tender relationship with her Divine Son. The expression “Birth-Giver of God” or Theotokos was given to her formally at the Third Ecumenical Church Council at Ephesus in a.d. 431. “Glykophilousa” is another term which translates as Sweet-Kissing, showing that their relationship was especially close and most expressively loving. “Panagia” means All-Pure which describes her intense life-long purity and continuous virginity before, during, and after giving birth to the Lord. 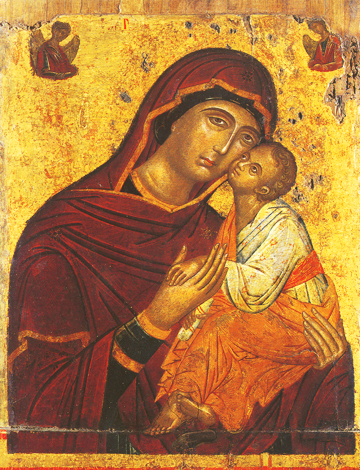 In this 15th century icon from Greece the Lord touches His cheek to His mother’s cheek and holds her hand as He gazes lovingly towards her. He is holding a prophet’s scroll in His right hand to portray that He is the fulfillment of the prophet’s words. Two angels look down from above in awe and reverence on the Mother and Child, the Handmaiden and Her God.